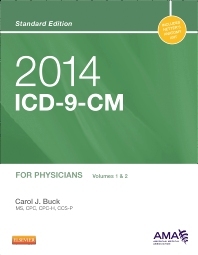 Code more efficiently and effectively with Carol J. Buck's 2014 ICD-9-CM for Physicians: Volumes 1 and 2, Standard Edition. Designed by coders for coders, this reference combines Netter's Anatomy illustrations and the Official Guidelines for Coding and Reporting. Its format makes it easy to access the ICD-9-CM information you need to stay up-to-date and ensure the most accurate billing and optimal reimbursement in physician-based and outpatient coding settings. In addition, you can take this resource into your certification exams for enhanced testing support! An exclusive focus on ICD-9-CM Volumes 1 & 2 provides clear, concise coverage of physician-based and hospital outpatient coding essentials. Unique! Netter’s anatomy art is included in the front of the book and cross referenced where appropriate within the Tabular list to help you understand complex anatomic information and how it may affect coding.